It seems a little odd that my last post two weeks ago was about snow and now I've just completed the first triathlon of the season. But that is March in North Carolina for you. Wild swings and unpredictability in the weather. Last weekend it was in the upper 70's but then we had another big change and the forecast for this weekends race was not looking good. 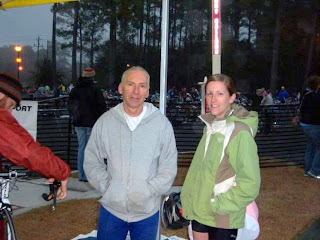 Highs in the 40's and rain are not ideal conditions for a triathlon and I was really not looking forward to going. I was reminded of why I said I'd never sign up for another one in March. So on Friday afternoon I began driving in the pouring rain towards Wilmington while thinking I should just go home and write this one off. As I got closer to Wilmington the rain began to taper off and by the time I arrived it was not raining at all. A good sign but the forecast was still for rain in the morning. I went straight to packet pick-up at Two Wheeler Dealer where I saw fellow NCRC members Bruce and Nancy Bokish and talked to them for awhile before heading to my motel. At 6:30 I went to meet Chris Damico and Amber Groves, a young couple from the NCRC that I had met through the clubs social series . Amber would be going for her triathlon debut and Chris would be along for support and to take photos. All of the ones here were taken by Chris and yes, that is me swimming in the top photo. We had a very nice time at dinner and it was great to get to know these fine young people better. I was up at 6am and very relieved to see that it wasn't raining although it was still quite cold outside. There had been a little mist and drizzle so the roads were going to be slick in spots too. I made the short drive over to UNCW and soon had my transition area set up. Amber and Chris arrived and after greetings from them I made my way into the natatorium to get warm. I was going to have a long wait because with the staggered start times of the swim I would not be beginning my race until 9:30. I found a comfortable spot and relaxed to watch the other racers and soon was joined by Amber and Chris after getting her bike gears fixed. At 9am I went down to warm up in the diving well before getting in line for my swim start. 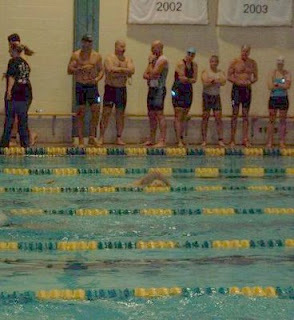 I was happy to be the last in my group so I wouldn't have to worry about anyone swimming over me. I felt strong and smooth in the water but I was not doing a good job of changing lanes at the end of each 50yds causing me to lose mometum. I still caught up to a slow swimmer after halfway but then I had to wait for three more coming the other way before I could make my pass which caused me to miss my predicted time by several seconds. It was still a very good effort for me and one of my best times for a pool swim sprint. I was really dreading running outside and over to the transtion area in that cold air but I had no choice so out the door I went. It was certainly uncomfortable but not too bad. Because of the distance from the pool to the bike transition area it took about 2.5 minutes just to run over there. I quickly toweled off and then put on a long sleeve shirt and a cycling vest that my wonderful friend Margo gave me that she had gotten from her brother in Italy. And I was very glad that I remembered to bring some winter cycling gloves. It was well worth the time it took to put them on to keep my hands comfortable with the cold air and the windchill I would be creating on the bike. I got off to a good start on the bike but I had no choice but to just go on effort and hope for the best. My cyclocomputer was broken so I had no idea how fast I was going or how far I was along the course. It is a very flat course but there are a lot of speedbumps and turns. The course was better this year though with just one big loop instead of two. The newer parts had some long straights as well as smoother surfaces. At one 90 degree turn onto a main road , a rider that had just passed me a little while earlier wiped out on the slick road going around the tight corner. He was ok and I eased my way around him and made the turn safely. I was feeling good and keeping a good cadence but I could only hope it would relate to a good time. As the bike finish came into view I looked at my watch to see how long I had been riding and was very please with what I saw. This would be one of the fasted average mph rides I had ever done and much faster than I had done in my previous 5 attempts here in my past triathlon life. I was quickly off the bike and running thanks to a good transition and was happy that my legs were feeling good. I have done a few bike/run bricks the past couple of weeks and they seem to be helping. I was trying to keep a high running cadence and soon settled into a strong pace. there were no mile markers that I could see but I felt I was running a good pace and after 7 or 8 minutes I was in a good rhythm and running stronger. It was an out and back course so I could tell at the turn that I was on a better than expected pace and a good time was in the bag. I was only passed by one young guy early in the run and I was passing quite a few which is a good indicator that I was havng a good one. 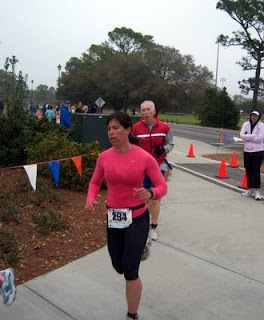 I finished strong and was thrilled with my time. I was sure it would be my fastest 5k time in a triathlon and after checking in my log books it is confirmed. Overall this was the best sprint tri overall I think I've ever done and certainly my best at Wimington. Amazing considering that I did my 1st one here 10 years ago. Not bad for a 53 year old to still be improving in the sport and after a three year layoff from swimming and biking. Afterwards I waited at the finish with Chris for Amber to complete her race. She did great and was very happy and excited with her debut. I think now Chris has the bug and will be looking to enter one soon. Overall it was a great weekend and I'm glad it didn't rain and I didn't let the cold keep me away. Wow, only 3 months now until Ironman time! !